Judge Dismisses San Bernardino Shooting Lawsuit Against Facebook, Google, Twitter Family members and victims of the 2015 mass shooting in California had accused the tech companies of knowingly supporting ISIS and helping the group spread its radical beliefs. 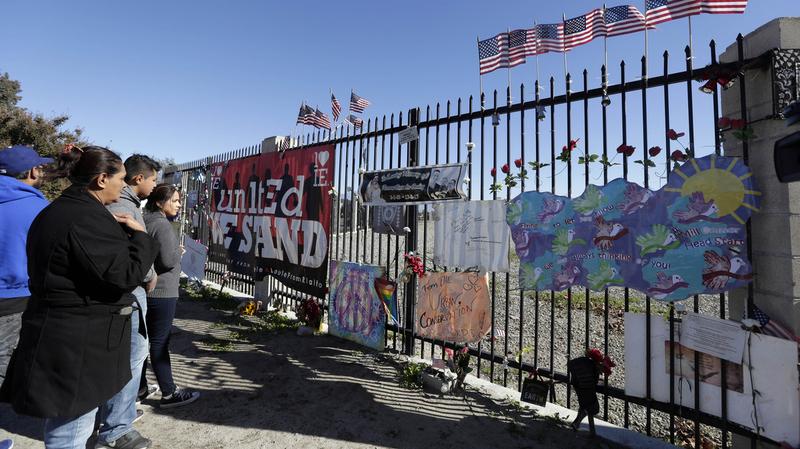 Mourners gathered in 2016 at a makeshift memorial in San Bernardino, Calif., for the victims of the 2015 mass shooting. A federal judge in San Francisco has dismissed a lawsuit filed by family members and victims of the 2015 mass shooting in San Bernardino, Calif., that accused Facebook, Google and Twitter of knowingly supporting ISIS and helping the group spread its radical beliefs. Fourteen people died and 22 were injured when Syed Rizwan Farook and Tashfeen Malik opened fire at a holiday office party on Dec. 2, 2015. ISIS claimed responsibility even though it apparently had no direct contact with the attackers. On the day of the massacre, Malik took to Facebook to pledge allegiance to ISIS leader Abu Bakr al-Baghdadi. In their 2017 lawsuit, the plaintiffs had argued that the tech companies "have knowingly and recklessly provided the terrorist group ISIS with accounts to use its social networks as a tool for spreading extremist propaganda, raising funds and attracting new recruits." "Without defendants Twitter, Facebook and Google (YouTube), the explosive growth of ISIS over the last few years into the most feared terrorist group in the world would not have been possible," the suit stated. In a decision issued Monday, however, U.S. Magistrate Judge Laurel Beeler wrote that while the three social media giants were "generally aware that ISIS used their services," there is no evidence that they "intended to further" the group's terrorist activity. What's more, Beeler wrote, given how "interconnected communication services are with modern economic and social life," it is untenable to try to directly link "the possible ripple effects of harm" with social media. A week after the shooting, then-FBI Director James Comey testified to Congress that social media had played a role in the radicalization of Farook and Malik and that they had been at least partly inspired by ISIS. Comey said the group "is motivating individuals, or very, very small groups of people to commit murder on their behalf." But as to how much the attackers were motivated by ISIS, he said, "We may never sort it out, because human motivation is hard." Beeler cited Comey's testimony in her decision to reject the lawsuit, saying the case had not been made that ISIS had actually "committed, planned, or authorized the San Bernardino attack." What Does It Mean When ISIS Claims Responsibility For An Attack? So far, the tech companies have not commented publicly on the judge's decision. But a lawyer for the plaintiffs, Keith Altman, says he plans to file an appeal. Altman is involved in similar lawsuits against social media companies in connection to ISIS or to ISIS-inspired attacks, including the 2016 Pulse nightclub shooting and the 2015 Paris terror attacks. "Don't help terrorists," Altman told NPR on Wednesday. "Given what's going on with social media, they have to be held accountable."